Established 1994 by Breeder/Owner/Handler Danielle Gutelius. Home of Top Quality Akitas. 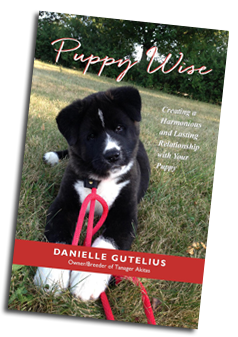 Danielle’s new book Puppy Wise is now available! The Tanager family of birds includes a vast array of small songbirds that thrive in many different areas around the world. These little birds are known for their fanciful and brilliant variety of colors, and the interesting adaptations they have made to thrive in their various habitats. My fascination with birds is the reason I chose the name of Tanager for my kennel. Birds as a whole embody the essence of freedom, limitless boundaries and radiate positive, uplifting energy wherever their flights take them. To me, the Tanager bird symbolizes the beauty, variety and adaptability of the Akita breed—my dog of choice. Welcome and enjoy touring my Site. Please come back and visit again.